White-tailed deer leave several recognizable signs in their travels through the woods. Some sign is dramatic, other sign is very subtle. Deer sign creates a kind of puzzle for hunters to solve. White-tailed deer leave several different types of sign as evidence of where they have been. Both bucks and does leave behind trails, tracks, droppings and beds. 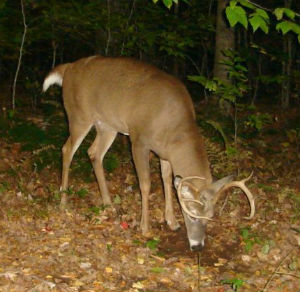 Bucks also leave behind rubs and scrapes as they prepare for the Fall rutting season. By understanding deer sign a hunter can learn the where... when... why... how... and even how big, while hunting whitetails. But, to hunt deer successfully, you must not only find deer sign -- you must interpret correctly what that sign tells you.